The OS303 model has been discontinued. Please see the OS685U as a possible alternative or contact our Temperature Engineering department. 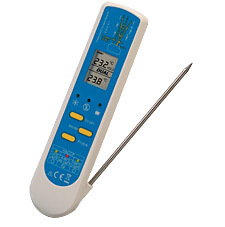 The OS303 utilizes a Hazard Analysis and Critical Control Point (HACCP) check mode which features 3 visible LED icons to indicate whether the temperature is within FDA guidelines for frozen or hot foods. The OS303 also features a lock mode for continuous readings of up to 30 minutes for infrared surface temperatures and 4 minutes for internal readings with the stainless steel penetration probe. Nota: Comes complete with 2 AAA batteries and operator’s manual.